Hydrogen sulfide has gained recognition as the third gaseous signaling molecule after nitric oxide and carbon monoxide. 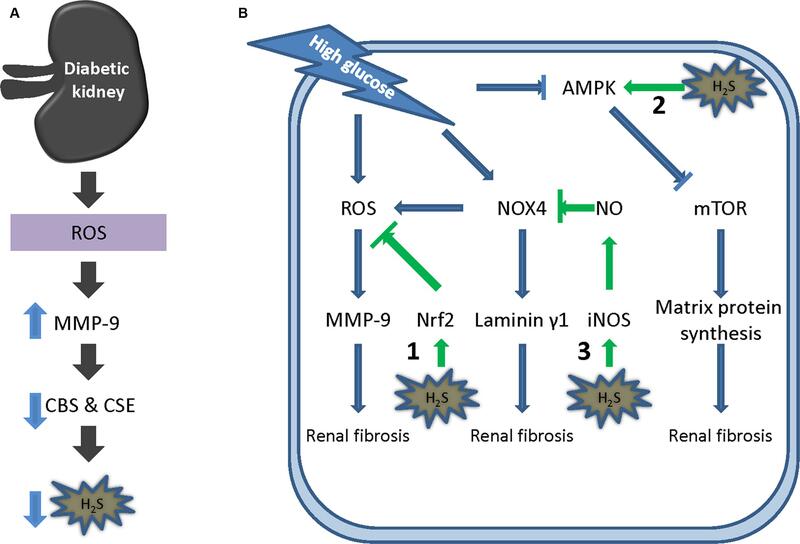 This review surveys the emerging role of H2S in mammalian renal system, with emphasis on both renal physiology and diseases. H2S is produced redundantly by four pathways in kidney, indicating the abundance of this gaseous molecule in the organ. In physiological conditions, H2S was found to regulate the excretory function of the kidney possibly by the inhibitory effect on sodium transporters on renal tubular cells. Likewise, it also influences the release of renin from juxtaglomerular cells and thereby modulates blood pressure. A possible role of H2S as an oxygen sensor has also been discussed, especially at renal medulla. Alternation of H2S level has been implicated in various pathological conditions such as renal ischemia/reperfusion, obstructive nephropathy, diabetic nephropathy, and hypertensive nephropathy. Moreover, H2S donors exhibit broad beneficial effects in renal diseases although a few conflicts need to be resolved. Further research reveals that multiple mechanisms are underlying the protective effects of H2S, including anti-inflammation, anti-oxidation, and anti-apoptosis. In the review, several research directions are also proposed including the role of mitochondrial H2S in renal diseases, H2S delivery to kidney by targeting D-amino acid oxidase/3-mercaptopyruvate sulfurtransferase (DAO/3-MST) pathway, effect of drug-like H2S donors in kidney diseases and understanding the molecular mechanism of H2S. The completion of the studies in these directions will not only improves our understanding of renal H2S functions but may also be critical to translate H2S to be a new therapy for renal diseases. Hydrogen sulfide has been regarded as a toxic gas for 100s of years (Smith and Gosselin, 1979). It can directly inhibit the activity of several essential enzymes in human namely cytochrome c oxidase (Reiffenstein et al., 1992), carbonic anhydrase (Nicholson et al., 1998), monoamine oxidase (Warenycia et al., 1989), and Na+/K+ ATPase (Reiffenstein et al., 1992), thereby causing toxicity. However, the image of H2S has been largely expanded since the revelation of H2S as an endogenous neuronal modulator by Kimura’s group in Abe and Kimura (1996). Thereafter, the physiological significance of H2S has been extensively studied especially in central nervous system (Zhang and Bian, 2014) and cardiovascular system (Liu et al., 2012). Emerging evidence has suggested that H2S also actively regulates renal function and is implicated in numerous kidney diseases in recent years. Here in this review, recent studies regarded the role of H2S in both kidney physiology and diseases will be discussed. Hydrogen sulfide exists as a colorless gas with a strong rotten egg smell at room temperature and ambient pressure. The human nose can detect a concentration of 400-fold lower than its toxic level (Wang, 2002), whereas, long term exposure can cause desensitization of olfactory nerves to H2S (Li et al., 2009). Distinct from the other gaseous transmitters like NO and CO, H2S is a weak acid and hence able to readily dissolve in water. Based on its PKa, it is estimated that there will be 14% H2S gas, 86% HS- and a trace of S2- in physiological condition (pH 7.4, 37°C; Li et al., 2009). Moreover, H2S gas is highly lipophilic which allows it freely to penetrate into the cell membrane of all types and become biologically active (Mathai et al., 2009). Three traditional H2S synthesizing pathways have been identified in mammalians including CSE (EC 4.4.1.1), CBS (EC 4.2.1.22), and 3-MST (EC 2.8.1.2) coupled with CAT (EC 2.6.1.3) pathways. The mechanisms underlying these traditional pathways can be found in our previous review in detail (Liu et al., 2012). In short, CSE firstly dimerizes two L-cysteine to L-cystine followed by transforming it into pyruvate, NH3 and thiocysteine. The resulted thiocystein is then used as a substrate by CSE to react with other thiols to generate H2S (Stipanuk and King, 1982). CBS catalyzes the reaction between L-cysteine and homocystenin into cystathinine and H2S (Szabo, 2007). However, 3-MST is unable to directly use L-cysteine as a substrate as its counterpart does. L-cysteine has to be transformed into 3-MP by CAT which is then catalyzed by 3-MST into pyruvate and H2S (Shibuya et al., 2009). It is worth mentioning that both CSE and CBS require pyridoxal 5′-phosphate as a cofactor to synthesize H2S, while 3-MST is dependent on zinc (Li et al., 2009). In addition, CSE and CBS mainly locate in cytosol yet they can translocate into mitochondria in some oxidative conditions (Fu et al., 2012), whereas 3-MST resides and generates H2S in mitochondria (Kimura, 2011). A fourth H2S generation pathway namely DAO/3-MST pathway was discovered recently by Kimura’s group (Shibuya et al., 2013). In the study, they showed that kidney lysate can produce 60 times more H2S when using D-cysteine as substrate comparing with L-cysteine. Further, the underlying mechanism was studied. Specifically, D-cysteine is transformed into 3-MP by peroxisome located DAO. Due to metabolite exchanges between peroxisome and mitochondria, 3-MP is imported into mitochondria and catalyzed into H2S by 3-MST. Since DAO is only located in brain and kidney, this H2S generating pathway is believed to exclusively exist in brain and kidney. Hydrogen sulfide generation is abundant in kidney given the presence of all the above mentioned pathways in this organ (Figure 1). Currently, it is believed that CSE and CBS are the dominated enzymes for H2S generation in kidney. The presence of these two enzymes was firstly demonstrated in 1980s by using their inhibitors (Stipanuk and Beck, 1982). Later on, House et al. (1997) suggested that both enzymes were mainly located on renal proximal tubules within the renal cortex by comparison with marker enzymes of known location. This finding was supported by several other studies using different methods (Ishii et al., 2004; Li et al., 2006; Tripatara et al., 2009). However, inconsistent results have been reported regarding the existence of these two enzymes in glomerulus which needs to be resolved (Aminzadeh and Vaziri, 2012; Bos et al., 2013; Yamamoto et al., 2013). In addition, definitive evidence has suggested the presence of 3-MST in kidney (Aminzadeh and Vaziri, 2012; Shibuya et al., 2013; Kimura, 2014; Pan et al., 2015), however, the significance of 3-MST mediated H2S generating pathway has not been well-acknowledged in both kidney physiology and diseases due to limited reports. Nevertheless, the revelation of the unique DAO/3-MST pathway in kidney and brain may imply a significant role of 3-MST mediated H2S generation in these organs. This will be an interesting area open to explore in the next years. FIGURE 1. Endogenous synthesis of H2S by four pathways in renal system. (1) CBS mediated H2S synthesis by using L-cysteine as the substrate in cytosol; (2) CSE mediated H2S synthesis with L-cysteine as the substrate in cytosol; (3) CAT transforms L-cysteine into 3MP which is further catalyzed by 3-MST into H2S in mitochondria; (4) Peroxisome resident DAO catalyzes D-cysteine into 3MP which is then exchanged into mitochondria and utilized by 3-MST for the production of H2S in mitochondria. CBS, cystathionine β-synthase; CSE, cystathionine γ-lyase; 3-MST, 3-mercaptopyruvate sulfurtransferase; CAT, cysteine aminotransferase; DAO, D-amino acid oxidase; 3MP, 3-mercaptopyruvate. The necessity of H2S producing enzymes have long been recognized in the kidney due to their critical effect on homocysteine metabolism (Stipanuk, 2004), however, the effect of H2S itself on renal function was not studied until recently. Intra-renal infusion of H2S donor NaHS is able to increase GFR, UNa⋅V and potassium (Uk⋅V) excretion (Xia et al., 2009; Ge et al., 2014). Moreover, the effect is closely mimicked by the infusion of L-cysteine, an H2S generating substrate (Xia et al., 2009). In addition, inhibition of endogenous H2S production by AOAA (CBS inhibitor) plus PAG (CSE inhibitor) leads to the decrease of GFR, UNa⋅V and Uk⋅V, suggesting that H2S regulates renal function in physiological conditions. However, either AOAA or PAG alone fails to produce any effect on renal function implicating a compensatory effect between CBS and CSE on renal regulation which has been confirmed by another study (Roy et al., 2012). Hypothesis concerning the effects of H2S on sodium transporters was formed and tested thereafter. The results showed that H2S significantly inhibited the activity of NKCC and NKA which may account for its effect on renal function (Figure 2A). Recently, the mechanism of the inhibitory effect of H2S on NKA was studied by Zhu’s group (Ge et al., 2014). In their study, they showed that NaHS promoted NKA endocytosis by directly activating epidermal growth factor receptor (EGFR) in renal tubular epithelia cells. Moreover, EGFR cys797 mutation fully abolished the effect of H2S suggesting a direct interaction between H2S and this cysteine residue. Taken together, both endogenous and exogenous H2S are able to increase GFR, UNa⋅V, and Uk⋅V excretion probably through the inhibitory effect on sodium transporters like NKCC and NKA. FIGURE 2. Effects of H2S on renal regulation. (A) H2S inhibits the activity of tubular NKCC and NKA, thereby enhancing renal excretory function such as GFR, UNa.V and Uk.V. (B) H2S suppresses renin release by inhibition of AC activity and ROS production in GC cells. (C) H2S as an O2 sensor in the kidney. In normoxic condition, H2S is metabolized into sulfates in the presence of O2; in hypoxic condition, the shortage of O2 leads to the accumulation of H2S which helps to restore O2 level by enhancing blood flow and suppressing tubular transport activity in kidney. NKCC, Na+/K+/2Cl- cotransporter; NKA, Na+/K+ ATPase; GFR, glomerular filtration rate; UNa⋅V, urinary sodium; Uk⋅V, urinary potassium; β1, β1-adrenoceptor; ROS, reactive oxygen species; ATP, adenosine triphosphate; cAMP, cyclic adenosine monophosphate; JG cell, juxtaglomerular cell. Hydrogen sulfide increases Cl-/HCO3- exchanger activity in various tissues like aortic tissues (Liu and Bian, 2010) and vascular smooth muscle cells (Lee et al., 2007). However, the effect of H2S on the exchanger in kidney is still unknown. It is likely that H2S can also enhance the activity of Cl-/HCO3- exchanger in renal system. Considering the critical role of Cl-/HCO3- exchanger in regulating the excretion of ions and homeostatic maintenance of physiological pH, it will be of great value to reveal the effect of H2S on Cl-/HCO3- exchanger activity and the subsequent consequence in kidney. The RAS is a renovascular hormone system involved in the regulation of plasma sodium concentration and blood pressure (BP). Renin release from JG cells determines RAS activity and the process is known to be regulated by intracellular cAMP (Peters et al., 1993; Gambaryan et al., 1998; Schweda et al., 2007). Moreover, H2S was reported to downregulate cAMP level in several cell types (Lim et al., 2008; Yong et al., 2008), implying that H2S may modulate renin release. This was demonstrated by our group in Lu et al. (2010). It was found that NaHS inhibited the upregulation of renin mRNA and protein level in a model of renovascular hypertension accompanying with a reduction of intracellular cAMP level. This is supported by another study (Lu et al., 2012) showing that H2S regulates renin degranulation in As4.1 and rat renin-rich kidney cells stimulated by isoproterenol, forskolin or 3-isobutyl-1-methylxanthine. Further study demonstrated that H2S significantly suppressed the stimulated AC activity in these cells. Overexpression of CSE also attenuates isoproterenol-induced renin release suggesting that endogenous H2S may also involve in the process. However, the mechanism underlying the inhibitory effect of H2S on AC remains to be determined, such as the identification of AC isoform(s) accounting for H2S effect and the molecular interaction between H2S and the AC isoform(s). Besides AC, ROS was recently reported to be a target of H2S for its effect on renin reduction in DN suggesting participation of multiple mechanisms in the process (Xue et al., 2013). The effect of H2S on renin activity in normal rats has also been investigated (Lu et al., 2010). The results showed that neither NaHS administration nor inhibition of endogenous H2S influenced renin activity implying that H2S may only modulate renal activity when RAS is overactivated. The effect of H2S on renin activity has been illustrated in Figure 2B. Essentially all H2S generation is independent of O2; however, the metabolism of H2S is a process highly relying on O2 (Olson, 2015). Accumulating evidence suggests that H2S is an O2 sensor in kidney, especially in medulla (Figure 2C). The availability of O2 in renal medulla is lower compared with that in renal cortex resulting in a higher abundance of H2S in this region (Koning et al., 2015). Provided mitochondria can use H2S as an electron donor for ATP production (Fu et al., 2012; Teng et al., 2013), it will be interesting to hypothesize that H2S might be a direct source of energy in renal medulla. During hypoxia, O2 reduction leads to further accumulation of H2S which help to recover O2 supply by increasing medullary blood flow and inhibition of tubular transport (Beltowski, 2010). In addition, CBS and CSE can translocate into mitochondria and stimulate H2S production under hypoxic circumstances (Fu et al., 2012; Teng et al., 2013). The mitochondria derived H2S may directly participate in ATP production. Currently, emerging physiological evidence for H2S mediated O2 sensing has also been suggested in various O2 sensing tissues including cardiovascular system (Olson et al., 2006; Olson and Whitfield, 2010), respiratory system (Hu et al., 2008), gastrointestinal tract (Dombkowski et al., 2011) et al. However, the downstream effectors of H2S mediated O2 sensing remains to be determined. Acute kidney injury (formerly known as acute renal failure) is defined as a syndrome characterized by rapid loss of the kidney’s excretory function. It is the clinical manifestation of several disorders that affect the kidney acutely (Bellomo et al., 2012). Here, H2S effects in three types of acute kidney injury will be discussed namely renal IRI, obstructive nephropathy, and cisplatin nephrotoxicity. Renal IRI is a major cause of acute kidney injury. The pathophysiological mechanism underlying renal IRI is very complex containing ATP depletion, calcium overload, ROS generation, apoptotic and inflammatory responses et al (Eltzschig and Eckle, 2011). The engagement of endogenous H2S in renal IRI has been thoroughly demonstrated in various studies. Specifically, both mRNA and protein levels of CSE and CBS are apparently reduced upon IRI along with the reduction of H2S level in kidney and plasma (Xu et al., 2009; Han et al., 2015), although mechanisms underlying IRI caused CSE and CBS reduction are still not revealed. In addition, inhibition of either CSE or CBS by their pharmacological inhibitors severely aggravates renal damage (Tripatara et al., 2008; Han et al., 2015) indicating that the ischemic renal injury might, at least in part, results from the impaired endogenous production of H2S. The implication is supported by a recent finding that CSE-deficiency associates with increased renal damage and mortality after renal IRI which might be due to the enhanced production of ROS (Bos et al., 2013). Subsequently, the effect of exogenous H2S was extensively studied in various renal IRI scenarios (Tripatara et al., 2008, 2009; Bos et al., 2009, 2013; Xu et al., 2009; Simon et al., 2011; Hunter et al., 2012; Zhu et al., 2012; Azizi et al., 2015; Han et al., 2015; Ahmad et al., 2016) which have been summarized in Table 1. In most studies, an H2S donor, NaHS, was employed and exerted protective effects likely through anti-inflammatory, anti-apoptotic, and anti-oxidative responses. Comparing with new generation synthetic H2S donors like GYY4137, NaHS is less physiologically accurate H2S producer (Li et al., 2008; Yu et al., 2010). Recently, GYY4137 was shown to attenuate heart damage by inhibiting activation of NF-κB and MAPK signaling in a rat model of myocardial IRI (Meng et al., 2015a,b). Thus, studies are warranted to study whether slow H2S donors like GYY4137 can protect kidney form IRI. Besides, it is worth noting that AP39, a mitochondrially targeted donor of H2S, was recently found to inhibit intracellular ROS formation caused by glucose oxidase and protect kidney from IRI caused damage in rats (Ahmad et al., 2016). The study implies the importance of mitochondria H2S in the pathology of renal IRI which needs to be determined in the future. TABLE 1. Comparison of the renal protective effect of H2S against ischemic/reperfusion injury. Obstructive nephropathy is a type of renal injury caused by obstruction of the genitourinary tract. Renal fibrosis after ureteral obstruction is implicated in the development of obstructive nephropathy (Boor et al., 2010). Hu’s group showed that ureteral obstruction impaired endogenous production of H2S by reducing the expression level of CBS (Song et al., 2014). Renal fibrosis is attenuated when exogenous H2S is administered suggesting an inhibitory effect of H2S on renal fibrosis (Song et al., 2014). In cultured kidney fibroblast, NaHS is able to inhibit cell proliferation and block the differentiation into myofibroblasts by suppressing transforming growth-β1-Smad and MAPK signaling pathways (Song et al., 2014). Furthermore, administration of NaHS also prevents the disruption of renal function caused by ureteral obstruction (Jiang et al., 2014; Song et al., 2014; Dursun et al., 2015). A recent study from Sener’s group (Lin et al., 2016) showed that H2S slow releasing donor GYY4137 mitigated cortical loss, inflammatory damage and tubulointerstitial fibrosis in a rat model of obstructive nephropathy. Taken together, these results suggest a potential use of H2S donor as a rescue in obstructive nephropathy. Cisplatin is a major therapeutic drug for solid tumors, but causes severe nephrotoxicity. Over 30% of patients receiving high dose cisplatin develop renal dysfunction (Pabla and Dong, 2008). However, effective treatment of cisplatin induced renal failure is still lacking. Extensive research revealed that oxidative stress and inflammatory response are the major driving forces for cisplatin induced renal toxicity (Pabla and Dong, 2008; Peres and da Cunha, 2013). Given the well-known inhibitory effects of H2S on oxidative stress and inflammation (Łowicka and Bełtowski, 2006), it is reasonable to hypothesize that H2S is protective against cisplatin nephrotoxicity. However, the role of H2S is rather controversial due to conflicting data in this field. Coimbra and others (Della Coletta Francescato et al., 2011) firstly showed that cisplatin upregulated the expression level of CSE after 3 days upon cisplatin treatment in a rat model. When PAG was administered with cisplatin, it was found that PAG abolished the upregulation of CSE and rescued cisplatin caused renal damage by suppressing inflammation and apoptosis (Della Coletta Francescato et al., 2011). In contrast to this study, administration of NaHS ameliorates the kidney dysfunction and damage in cisplatin treated rat (Ahangarpour et al., 2014). Liu et al. (2016) recently showed that both CSE and CBS levels were severely decreased upon cisplatin treatment in mouse after 3 days. However, pretreatment with H2S slow releasing donor GYY4137 aggravates cisplatin induced renal damage by increasing inflammatory response (Liu et al., 2016). However, several defects on the use of GYY4137 need to be pointed out in the study. As they used a rather low dose of GYY4137 (21 mg/kg), it is possible that H2S might be not generated sufficiently (Li et al., 2008; Yu et al., 2010; Meng et al., 2015a,b; Lin et al., 2016). In addition, to rule out the possibility that the chemical backbone of GYY4137 molecule has aggravated cisplatin nephrotoxicity, ZYJ1122 (Lee et al., 2011), a structure analog of GYY4127, should be included for the study. Despite the promising protective effect of H2S, however, it is still far from the conclusion that H2S is protective in cisplatin nephrotoxicity. In future, more studies are still needed to further investigate (1) the change of CSE and CBS expression level in a time course dependant manner; (2) the effect of endogenous H2S by using genetic mouse rather than non-specific CBS/CSE inhibitors; (3) the effect of exogenous H2S by using different H2S (NaHS, GYY4137, AP39) donors in parallel. Chronic kidney disease is a general term for heterogeneous disorders affecting kidney structure and function. In western countries, it is generally associated with old age, diabetes, hypertension, obesity, and cardiovascular disease (Levey and Coresh, 2012). Diabetic nephropathy and hypertensive nephropathy are considered as presumed pathological entities. The role of H2S in these two types of CKD will be reviewed below. Diabetic nephropathy is the number one leading cause of CKD in western countries. Morphologically, DN is characterized by hypertrophy induced kidney growth and excessive accumulation of extracellular matrix proteins, eventually proceeding to fibrosis of glomerular and tubulointerstitial compartments (Cooper, 1998; Dronavalli et al., 2008). Current evidence suggests an active role of H2S in the pathogenesis of DN. Plasma H2S level in DN patients is significantly lower than that in non-DN patients undergoing chronic hemodialysis (Li et al., 2014). High urinary sulfate concentration, a reflection of high plasma H2S level, is associated with reduced risk of renal disease progression in type 2 diabetes (van den Born et al., 2016) and slower decline in Cr51-EDTA-assessed GFR in DN patients (Andresdottir et al., 2013). Recent data suggested that the renal expression of H2S producing enzyme CBS and CSE is down-regulated in pancreatic CaMTg diabetic mice (Yamamoto et al., 2013), C57BL/KsJ lepr-/- db/db mice (Lee et al., 2012), STZ-diabetic rats (Yuan et al., 2011), and Akita diabetic mice (Kundu et al., 2013). Inhibition of CSE with PAG mimics high glucose-induced glomerular podocyte injury (Liu et al., 2015), implying a contributive role of endogenous H2S in DN. The mechanisms underlying CBS and CSE reduction have been also studied. Kundu et al. (2013) showed that MMP-9 was upregulated in Akita diabetic mice along with the reduction of CBS and CSE. When MMP-9 is knocked out, the expression of the two H2S producing enzyme namely CSE and CBS shows a trend toward baseline despite hyperglycemia (Kundu et al., 2013) suggesting that MMP-9 regulates CBS and CSE expression in DN (Figure 3A). FIGURE 3. Hydrogen sulfide in DN. (A) ROS mediated MMP-9 up-regulation reduces the level of CBS and CSE in DN. (B) Mechanisms underlying the protective effect of H2S in DN. (1) H2S inhibits ROS formation by activating Nrf2 pathway; (2) H2S activates AMPK, thereby suppressing PI3K/Akt/mTORC1 signaling and subsequent protein synthesis; (3) H2S stimulates NO formation by induction of iNOS expression which inhibits NOX4 level and ROS production. ROS, reactive oxygen species; MMP-9, matrix metalloproteinase-9; AMPK, AMP-activated protein kinase; NO, nitric oxide; iNOS, inducible nitric oxide synthase; mTOR, mechanistic target of rapamycin. Meanwhile, exogenous H2S has been proved to be effective in in vitro and in vivo DN models. High glucose caused cell proliferation and collagen formation are attenuated by NaHS in cultured messangial cells (Yuan et al., 2011) and tubular cells (Safar and Abdelsalam, 2015). Moreover, NaHS alone (Yuan et al., 2011; Ahmad et al., 2012; Lee et al., 2012; Kundu et al., 2013; Xue et al., 2013; Zhou et al., 2014; Liu et al., 2015; Safar and Abdelsalam, 2015; Qian et al., 2016) or with losartan (Kaur et al., 2015) ameliorates renal dysfunction and fibrosis formation in various DN related animal models. At least three mechanisms (Figure 3B) are implicated in H2S mediated protective effect in DN: (1) Inhibition of ROS formation by activating Nrf2 pathway. Hyperglycemia induces intracellular ROS which upregulates the expression of MMP-9 (Kundu et al., 2013). MMP-9 plays a major role in diabetic renovascular remodeling. In a STZ induced diabetic rat model, H2S was found to reduce high glucose induced oxidative stress by activating the Nrf2 antioxidant pathway and thereby the level of MMP-9 (Zhou et al., 2014); (2) AMPK activation. Matrix protein deposition requires stimulation of protein synthesis. In DN, PI3K/Akt/mTORC1 signaling is activated due to the suppression of AMPK activity (Yuzawa, 2012). The inactivation of AMPK was found to be partially ascribed to the reduction of H2S level (Lee et al., 2012). NaHS dose- and time- dependently activates the phosphorylation of AMPK and inhibits the stimulation of mTOR (Lee et al., 2012). As a result, mTOR mediated protein synthesis is inhibited which partially accounts for the protective effect of H2S in DN. (3) Stimulation of NO formation. Hyperglycemia upregulates NOX4 expression resulting in the generation of intracellular ROS and laminin γ1, both of which contribute to renovascular remodeling (Gorin et al., 2015). Expression of NOX4 can be attenuated by H2S (Kamat et al., 2015). L-NAME, a NOS inhibitor, abolished the effect of H2S (Feliers et al., 2016). Further study showed that H2S upregulates the protein expression of iNOS but not that of eNOS (Feliers et al., 2016). Moreover, iNOS siRNA can block the effect of H2S (Feliers et al., 2016) suggesting a role for NO in H2S mediated protective effect in DN. Interestingly, NO can also stimulate the activity of CSE and H2S production (Nagpure and Bian, 2016) suggesting a cross-talk interaction between these two pathways. Hypertensive nephropathy, a result of chronic hypertension, is the second leading cause of CKD worldwide (Hart and Bakris, 2010). Long time of high BP load results in damages of kidney, especially in glomerulus. When kidney cannot function properly, it fails to regulate BP. In turn, BP will rise up which further aggravates renal damage (Bidani and Griffin, 2004). Extensive evidence suggests a role of H2S in BP control. Genetic deletion of CSE causes hypertension and diminished endothelium dependent vasorelaxation (Yang et al., 2008). Similar with this, inhibition of both CBS and CSE also increases BP in rat (Roy et al., 2012). These data implies that H2S is a physiologic regulator of BP. Further studies suggest that H2S functions as both an EDHF (Mustafa et al., 2011; Edwards et al., 2012; Tang et al., 2013) and an EDRF (Wang, 2009). The BP lowering effect of exogenous H2S has been subsequently determined. Our group first showed that H2S donor, NaHS, attenuated BP by inhibiting plasma renin activity in a 2K1C rat model (Lu et al., 2010). Thereafter, NaHS was demonstrated to reduce BP in spontaneous hypertensive rats (Ahmad et al., 2014), angiotensin II treated mice (Al-Magableh et al., 2015), and sFlt transgenic mice (Holwerda et al., 2014). Additionally, renal protective effects of H2S have also been reported in hypertensive nephropathy. sFlt overexpression in mouse results in hypertension with proteinuria and glomerular endothelosis, all of which are apparently attenuated by administration of NaHS (Holwerda et al., 2014). Further study suggests an involvement of VEGF in this H2S mediated effect (Holwerda et al., 2014). Both H2S and tempol were found to alleviate renal dysfunction in a spontaneous hypertensive rat model by suppressing ROS formation (Ahmad et al., 2014). Recently, Jin’s group reported that either NaHS or its metabolite sodium thiosulfate attenuated angiotensin II induced proteinuria, renal dysfunction, and structural deterioration in rat (Al-Magableh et al., 2015). Further studies suggested that the renal effects of H2S were partially mediated by suppression of epithelial sodium channel (Zhang et al., 2013; Wang et al., 2015). Taken together, H2S might be an ideal candidate for the treatment of hypertensive nephropathy. In contrast to the extensive studies on CBS and CSE in various kidney diseases, the role of 3-MST is largely neglected although definitive evidence has demonstrated its abundance in kidney (Aminzadeh and Vaziri, 2012; Shibuya et al., 2013; Kimura, 2014). 3-MST resides in mitochondria and is the major producer of mitochondria derived H2S. 3-MST silencing was reported to reduce bioenergetic parameters and H2S can serve as an electron donor in mammalian cells (Modis et al., 2013), indicating a possible physiological role of 3-MST/H2S pathway in maintaining mitochondrial electron transport and cellular bioenergitics. Renal ischemia is the most common cause of acute kidney injury. Hypoxia leads to the inhibition of mitochondrial respiratory chain by deprivation of O2. What will happen if H2S is supplemented into the mitochondria when hypoxia occurs? Szabo’s group (Ahmad et al., 2016) showed that mitochondrially targeted H2S donor AP39 ameliorated renal damage in an ischemia/reperfusion rat model, suggesting possible involvement of 3-MST/H2S pathway in the pathogenesis although the change of 3-MST level and activity upon hypoxia was not determined. Additionally, the importance of 3-MST/H2S pathway is also suggested by the fact that ROS, the common cause of renal diseases of all types, induces the translocation of CBS and CSE into mitochondria (Fu et al., 2012). Thus, the revelation of the involvement of 3-MST in kidney diseases is of great value. Safety is always a concern when administrating H2S systemically due to its well-known toxicity (Guidotti, 2010; Hirose, 2010) which might hamper its development as therapeutics. This safety issue might be diminished by specific delivery of H2S to the targeted organs. Unfortunately, such organ specific H2S donor is not reported. The discovery of DAO/3-MST pathway might provide a clue about how to deliver H2S specifically into the kidney. The pathway uniquely utilizes D-cysteine rather than L-cystein to produce H2S and exclusively exists in cerebellum and kidney (Shibuya et al., 2013). When D-cysteine is given, it attenuates IRI in kidney with higher potency than L-cysteine (Shibuya et al., 2013). As H2S is broadly renal protective as we have reviewed above, D-cysteine might also ameliorate other renal diseases. 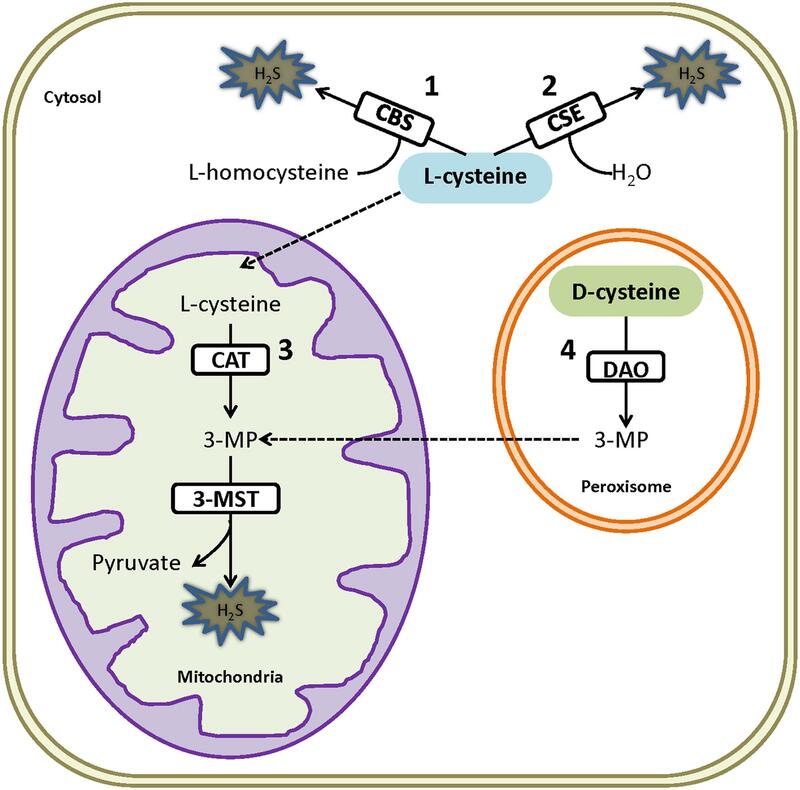 Direct administration of D-cysteine induces the generation of H2S in both cerebellum and kidney (Shibuya et al., 2013). Nevertheless, it is possible that structural modification of D-cysteine can generate a novel moiety providing D-cysteine to kidney but not cerebellum due to the impermeability of blood–brain barrier. This hypothesis warrants further investigation. To date, most studies of H2S effect in kidney have been largely restricted to the use of NaHS as an H2S donor despite of rare exceptions with GYY4137 or AP39. However, NaHS releases H2S at an uncontrolled manner (Li et al., 2008) and is unlikely to be a therapeutic agent (Szabo, 2007). Numerous drug-like H2S donors have been developed and some of them are under the investigation in clinical trials. For instance, an orally active H2S donor SG-1002 is proven to be safe in humans and underwent Phase II study for heart failure (ClinicalTrials.gov identifier: NCT01989208); Antibe Therapeutics are conducting several preclinical or clinical studies with their various H2S donors (ATB-346 for osteoarthritis; ATB-352 for Acute pain; ATB-350 for Thrombosis). 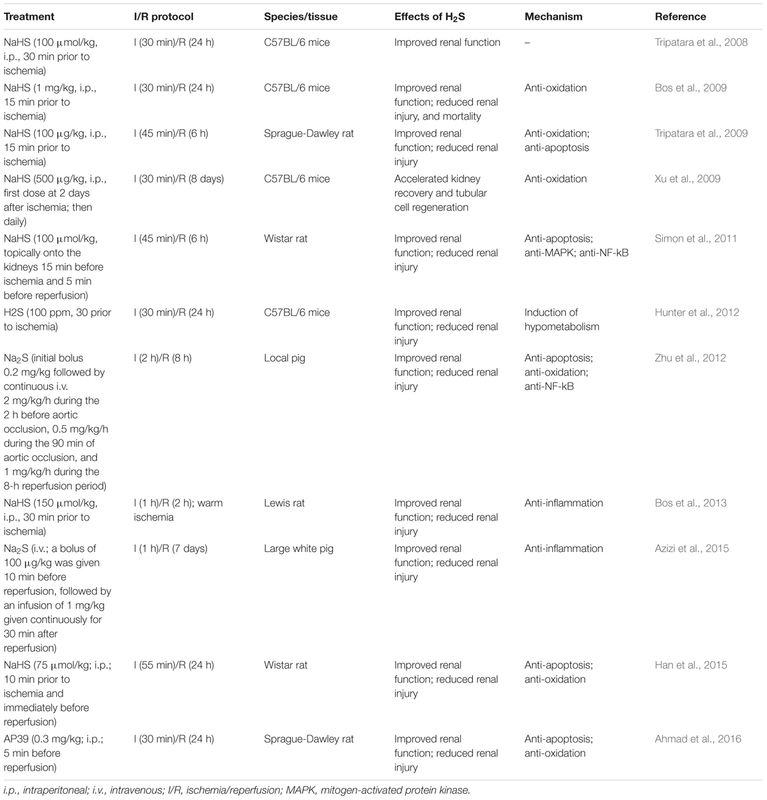 The information on these H2S releasing donors can be found in Wallace and Wang (2015). Testing of these drug-like H2S donors will not only consolidate the protective effect of H2S, but also shed light on the translation of H2S as a therapeutic agent for renal diseases. Last, but not least, one should bear in mind that the molecular mechanisms underlying H2S effect is still not well-understood. It seems that H2S may partially exert its effect as a reducing agent to eliminate ROS (Bruce King, 2013), while its effects on gene expression may be related to specific molecular targets like NF-κB and the ERK pathways (Oh et al., 2006). However, the molecular details are still unclear. Thus, the in-depth portrayal about the interaction between H2S and its target protein will be interesting. After recognition as the third gaseous mediator after NO and CO, the biological actions of H2S are still expanding. In kidney, it is actively participating in the renal regulation in physiological condition. Due to the regulatory role of kidney in the body, it is possible that H2S has far-reaching actions by modulating renal function which needs to be uncovered. Because of the significant role of H2S in renal physiology, it is not surprising that dysfunction of H2S contributes to the pathogenesis of kidney related diseases. Thereafter, administration of H2S mainly with NaHS was proven to rescue kidney damages in animal models with various types of kidney diseases. In the future, drug like H2S donors need to be tested to translate H2S as a treatment for renal diseases in clinical. Besides, in-depth studies of H2S mediated molecular actions are also needed to complete our understanding of the role of H2S in both renal physiology and pathology. This work was supported by grants from NMRC/CIRG/1432/2015 and NUHSRO/2011/012/STB/B2B-08. AC, adenylate cyclase; AMPK, 5′ AMP-activated protein kinase; AOAA, aminooxyacetic acid; CaMTg, pancreatic β-cell specific calmodulin-overexpressing transgenic; CAT, cysteine aminotransferase; CBS, cystathionine β-synthase; CKD, chronic kidney disease; CO, carbon monoxide; CSE, cystathionine γ-lyase; DAO, D-amino acid oxidase; DN, diabetic nephropathy; EDHF, endothelium-derived hyperpolarizing factor; EDRF, endothelium-derived relaxing factor; GFR, glomerular filtration rate; H2S, hydrogen sulfide; IRI, ischemia/reperfusion injury; JG, juxtaglomerular; MAPK, mitogen-activated protein kinase; MMP-9, matrix metalloproteinase-9; NF-κB, nuclear factor-κB; NKA, Na+/K+ ATPase; NKCC, Na+/K+/2Cl- cotransporter; NO, nitric oxide; PAG, DL-propargylglycine; RAS, renin–angiotensin system; ROS, reactive oxygen species; STZ, streptozotocin; Uk⋅V, urinary potassium; UNa⋅V, urinary sodium; VEGF, vascular endothelial growth factor; 3-MP, 3-mercaptopyruvate; 3-MST, 3-mercaptopyruvate sulfurtransferase. Abe, K., and Kimura, H. (1996). The possible role of hydrogen sulfide as an endogenous neuromodulator. J. Neurosci. 16, 1066–1071. Ahangarpour, A., Abdollahzade Fard, A., Gharibnaseri, M. K., Jalali, T., and Rashidi, I. (2014). Hydrogen sulfide ameliorates the kidney dysfunction and damage in cisplatin-induced nephrotoxicity in rat. Vet. Res. Forum 5, 121–127. Edwards, G., Feletou, M., and Weston, A. H. (2012). Hydrogen sulfide as an endothelium-derived hyperpolarizing factor in rodent mesenteric arteries. Circ. Res. 110, e13–e14. Eltzschig, H. K., and Eckle, T. (2011). Ischemia and reperfusion [mdash] from mechanism to translation. Nat. Med. 17, 1391–1401. Feliers, D., Lee, H. J., and Kasinath, B. S. (2016). Hydrogen sulfide in renal physiology and disease. Antioxid. Redox Signal. doi: 10.1089/ars.2015.6596 [Epub ahead of print]. Hirose, Y. (2010). [Clinical aspects of hydrogen sulfide poisoning]. Chudoku Kenkyu 23, 212–216. House, J. D., Brosnan, M. E., and Brosnan, J. T. (1997). Characterization of homocysteine metabolism in the rat kidney. Biochem. J. 328(Pt 1), 287–292. Ishii, I., Akahoshi, N., Yu, X. N., Kobayashi, Y., Namekata, K., Komaki, G., et al. (2004). Murine cystathionine gamma-lyase: complete cDNA and genomic sequences, promoter activity, tissue distribution and developmental expression. Biochem. J. 381(Pt 1), 113–123. Lin, S., Visram, F., Liu, W., Haig, A., Jiang, J., Mok, A., et al. (2016). GYY4137, a slow-releasing hydrogen sulfide donor, ameliorates renal damage associated with chronic obstructive uropathy. J. Urol. doi: 10.1016/j.juro.2016.05.029 [Epub ahead of print]. Liu, Y., Zhao, H., Qiang, Y., Qian, G., Lu, S., Chen, J., et al. (2015). Effects of hydrogen sulfide on high glucose-induced glomerular podocyte injury in mice. Int. J. Clin. Exp. Pathol. 8, 6814–6820. Łowicka, E., and Bełtowski, J. (2006). Hydrogen sulfide (H2S)-the third gas of interest for pharmacologists. Pharmacol. Rep. 59, 4–24. Qian, X., Li, X., Ma, F., Luo, S., Ge, R., and Zhu, Y. (2016). Novel hydrogen sulfide-releasing compound, S-propargyl-cysteine, prevents STZ-induced diabetic nephropathy. Biochem. Biophys. Res. Commun. 473, 931–938. Stipanuk, M. H., and Beck, P. W. (1982). Characterization of the enzymic capacity for cysteine desulphhydration in liver and kidney of the rat. Biochem. J. 206, 267–277. Warenycia, M. W., Smith, K. A., Blashko, C. S., Kombian, S. B., and Reiffenstein, R. J. (1989). Monoamine oxidase inhibition as a sequel of hydrogen sulfide intoxication: increases in brain catecholamine and 5-hydroxytryptamine levels. Arch. Toxicol. 63, 131–136. Yu, F., Zhao, J., Tang, C. S., and Geng, B. (2010). [Effect of synthesized GYY4137, a slowly releasing hydrogen sulfide donor, on cell viability and distribution of hydrogen sulfide in mice]. Beijing Da Xue. Xue. Bao 42, 493–497. Copyright © 2016 Cao and Bian. This is an open-access article distributed under the terms of the Creative Commons Attribution License (CC BY). The use, distribution or reproduction in other forums is permitted, provided the original author(s) or licensor are credited and that the original publication in this journal is cited, in accordance with accepted academic practice. No use, distribution or reproduction is permitted which does not comply with these terms.